Bread pudding in our house was a treat for us – and a thrifty dessert. My mother, a child of the Great Depression, knew how to stretch ingredients for our family of six. I believe this recipe came from a 1950s series of cookbooks she owned called the Mary Margaret McBride Encyclopedia of Cooking. She used to recall the bread pudding her maternal grandmother, Mary Jane (Gaffney) McGinnis, made for her in the early 1930s, and whenever she made her own version for us, she would slice it into pieces while it was still warm and sprinkle a bit of sugar on top before serving it. Though at first glance the amounts of milk and bread crumbs may look anything but thrifty, the trick is in how you improvise. Sometimes when money was tight for our young and growing family, the milk my mother used to make bread pudding came from a box. Not only does powdered milk cost much less than fresh milk, but it also keeps longer and needs no refrigeration. She made the bread cubes from dried stale bread. 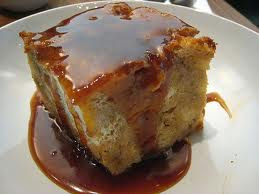 Maybe it is a good thing that I do not see bread pudding on restaurant menus much these days. That way, I know that if I really want a taste of my childhood, I can re-create it in my own kitchen, complete with memories of my mother’s love that are as sweet and warm as this delightful pudding. Combine eggs, sugar, salt, vanilla, and nutmeg. Add scalded milk and butter; mix well. Add bread cubes and pour into buttered baking dish. Set baking dish in a pan of hot water. Bake at 350 degrees for 45 – 50 minutes, or until a knife inserted in center comes out clean. Serve warm or cold with cream, plain or whipped, hard sauce, or lemon sauce. Top with ice cream if desired. Cake or gingerbread may be substituted for bread crumbs. My mother made bread pudding too and I'm sure the thrifty had something to do with it. She needed to use stale bread. I remember her using lots of powdered milk too. I don't have my mothers recipes. When I would as her, it was always I just use whatever I have. Yes, I think our mothers were good at being thrifty back then. My mother also used stale bread, which she said was the best kind for this pudding.